Moments ago, US President Donald Trump and First Lady Melania Trump had tea with Queen Elizabeth II, concluding their two-day trip to England. The First Couple now travels on to Scotland (taking a flight to Glasgow) where they will enjoy a private vacation (at Mr. Trump’s golf resort at Turnberry in South Ayrshire) before POTUS goes onwards to Helsinki, Finland next Monday 16 July for a one-on-one with Russian President Vladimir Putin. 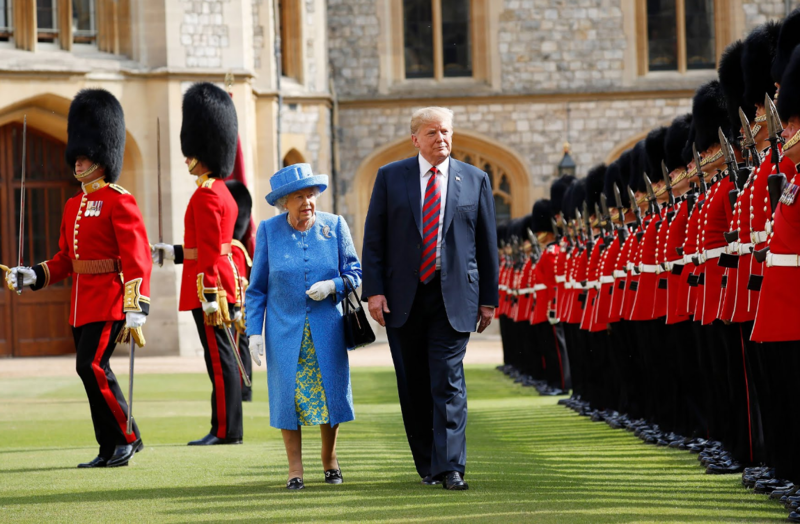 President Trump also reviewed an honorary guard together with Queen Elizabeth II at Windsor Castle. President Donald Trump and First Lady Melania Trump had tea together with Queen Elizabeth II in Windsor Castle's Oak Room. An important difference with the last US President that visited and one that was similarly seen when visiting the Japanese Emperor was that Mr. Trump did not bow as he shook hands briefly with the Queen when arriving at the castle. The British monarch smiled politely and shared a few words with the First Couple before the tree of them stood together whilst the military band played a rendition of the American national anthem. Muh Spurs muh spurs oh hell lets just meet the leaders of the free world for a quick photo op. But muh spurs are killing me. kek!! !